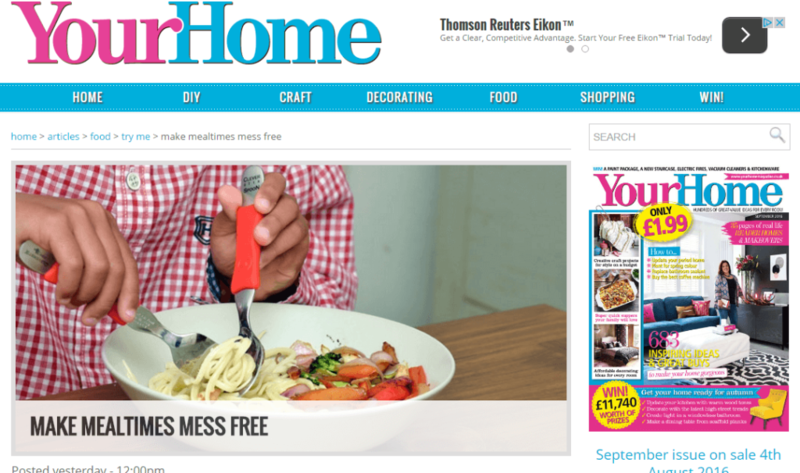 Clever Fork & Spoon Set scoops Your Home magazine ‘try me’ Product of the Week! Despite only being launched last month, the Clever Fork & Spoon Set is already causing a stir: “Does serving pasta and noodles to pasta your children end up with you needing to repaint your kitchen walls?” asks Your Home Magazine. Such is the publication’s elation that there is finally an innovative and practical solution to the all-too-common issue of children attempting to eat spaghetti the media outlet has, for a second time, awarded CleverstiX.com their ‘Try Me’ Product of the Week! Your Home magazine Clever Fork & Spoon Set: ‘Try Me’ Product of the Week! Your Home Magazine enjoys an incredible 57,000 followers on Twitter – and the combination of the Clever Fork’s Safety Tips and Anti-Slip Prongs solving a widespread problem, alongside the on-going child development provided by the ‘easy-twist’ streamline silicone grips so kids can train themselves to eat correctly, meant those thousands were alerted when the news was tweeted. Your Home Magazine chooses CleverstiX as their ‘Try Me’ Product of the Week! Find out more about the Clever Fork & Spoon Set HERE. BUY the Clever Fork & Spoon Set HERE. ORDER WHOLESALE stock of the Clever Fork & Spoon Set by getting in touch HERE.